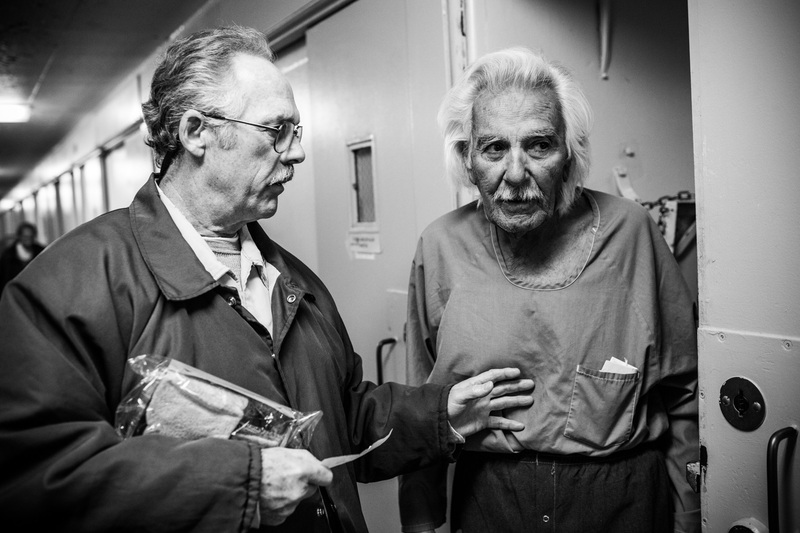 Anthony Alvarez (R), age 82, who is starting to suffer from memory issues, is helped by Phillip Burdick, a fellow prisoner and member of the Gold Coats program at California Men's Colony prison on December 19, 2013 in San Luis Obispo, California. The Gold Coats program is a volunteer care program where healthy prisoners volunteer to take care of elderly prisoners who either need general assistance with mobility and every day life or who also struggle with Alzheimer's and dementia. The program, the first of it's kind in the country, has existed for approximately 25 years. Burdick, age 62, has been volunteering with the Gold Coats for over 18 years - he is the longest serving member of the Gold Coats. Burdick, who says he became a Christian in prison over 30 years ago, has served 37 years on a 7-years-to-life sentence for first degree murder. "Being a Christian man, I know God has a plan for everything," Burdick says. When asked why he joined the Gold Coats he responds, "I was attracted to helping other less fortunate than myself - I can't imagine doing anything better in prison." He hopes to work in a similar line of work if he is released.